Happy Snap #17 Dockers First Hurrah! I just quickly want to post this picture from the family photo album as there are a few interesting little aspects to it. Firstly, this is just seconds before the Fremantle Football Club commenced playing in the Australian Football League, round 1, 1995. The time is 2:10…traditionally when matches used to begin! It’s anyone’s guess these days! We were there because Richmond were again used as the guinea pigs to welcome a new Western Australian club into the big time. A disgruntled Eagles fan perhaps? Sick of success? Or perhaps sick of being on a ten year waiting list to get a seat at a home match? 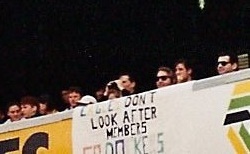 Either way, this Freo fan or fans have failed miserably in one aspect…you can’t read yellow texta from a distance! Richmond nervously held on for a 5 point win, with little indication that it would be the first of 7 successive victories. 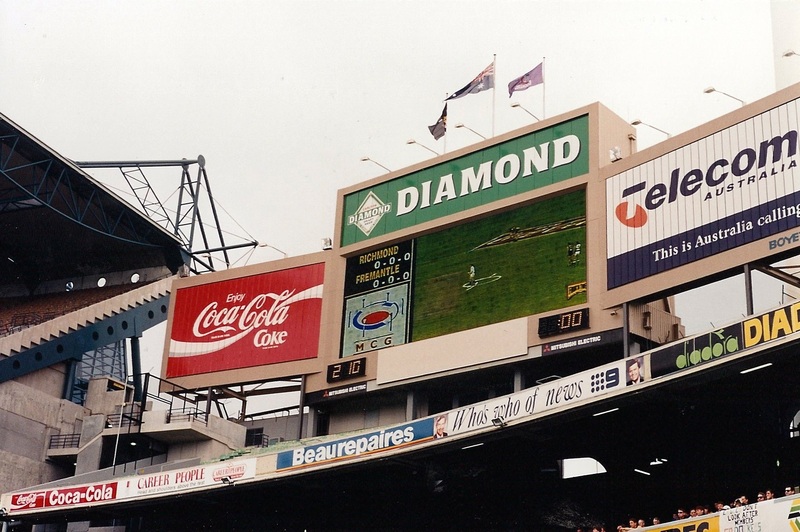 As a side, this is the old Western or Ponsford stand at the MCG, and the photo is dated by the ‘Telecom’ (not Telstra) and “Brian Nailor-Ray Martin…Who’s who of news” advertisements! PS.Thanks to mum for her happy-snappery!